You can choose whether you want your three (for Nove 3) or four (for Nove 4) layers to be soft, medium, or firm. Additionally, if you are purchasing a Queen or King size mattress, you can customize each side to be a different firmness level. After you have slept on the mattress, if you want to change the firmness levels of the latex, you can purchase a new layer. You can also shift the pieces of natural latex in your mattress. For example, you originally layered a soft on top, medium in the middle, and firm on the bottom. If you find this mattress too soft, you can move the medium in the middle layer up to the top (such that the mattress will be layered medium-soft-firm, or you can move the firm layer to the middle (such that the mattress will be layered soft-firm-medium), or use any configuration you'd like to to make it right for you. Although softer layers are typically placed on top, it doesn't harm the natural latex at all to place them in a different order. You can also specify which layers are split (different firmness levels for each side) and which layers are solid. For example, if both people sleeping in the bed want a soft layer on top, but want different layers underneath, you can choose to have the top layer solid and the bottom layers split. Are you a side sleeper, back sleeper, stomach sleeper, or a combination? People who sleep on their side tend to need a soft or medium mattress so that hips and/or shoulders can "sink" into the mattress and still allow the spine to stay aligned. People who sleep on their backs or stomachs tend to need a medium or firm mattress so that their spine will stay supported and not "bow" by sinking into a soft mattress. Smaller people can sleep on either soft or firm mattresses depending on their preference (although we prefer softer mattresses for light people). Heavier people tend to need a firmer mattress for proper body support. The above are guidelines, but you know your body best. If you prefer a soft mattress, you should adjust your firmness level to be a bit softer. If you like a super firm mattress, even if you are a side sleeper, you should choose a firmer mattress. The majority of our customers who have taken advantage of our comfort guarantee purchase a softer layer than originally chosen. Please keep in mind, that with latex mattresses, you can sleep on a softer mattress that still supports your body well and does not "sag" as traditional innerspring mattresses tend to do. 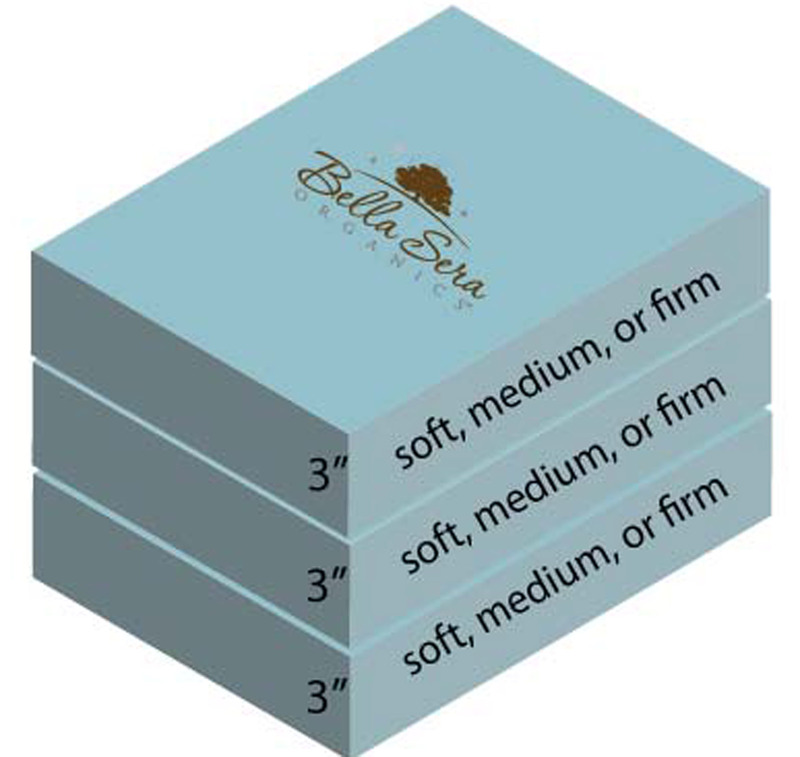 We would encourage you to choose one layer softer than your firmness preference. How about the Nove 3 and Nove 4 Pillowtop? A soft Nove 3 or Nove 4 will allow your body to conform to the mattress, but still does not have the feel of a plush or a pillowtop mattress. If you like the feel of a pillowtop or prefer a super soft mattress, we would encourage you to purchase a Nove Pillowtop organic mattress. Additionally, if you need a firmer mattress for support, but like a little extra softness on top, a pillowtop mattress is a great choice. © Bella Sera Organics 2010-2017. All rights reserved.